Ultratech 9606 P1 plus spill pallet without drain offers safer and less strenuous drum handling with its low profile that is nearly 50% lower than standard spill pallets. Sump is made of low-density polyethylene with UV inhibitors for long-lasting use. Removable injection-molded polyethylene foam grate features a non-slip surface. Able to hold one 55 gallon steel or poly drum or any other smaller container to contain leaks, drips, and spills. Spill capacity of 62 gallons. Load capacity of 800 lbs. 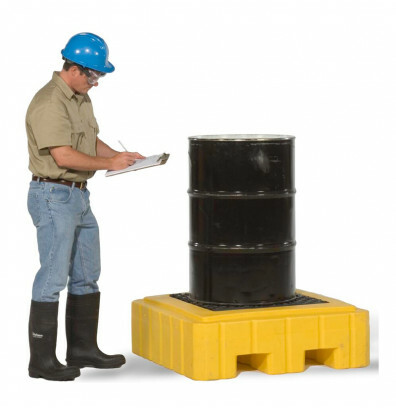 This spill pallet meets EPA SPCC (Spill Prevention, Control, and Countermeasure), 40 CFR 264.175, and Uniform Fire Code Spill Containment Regulations. Spill containment for one 55 gallon drum or any other smaller container. Contain hazardous liquid leaks, drips, and spills. Sump is constructed of rust and corrosion free polyethylene. Removable injection-molded polyethylene foam grate. Meets EPA SPCC, 40 CFR 264.175, and UFC Spill Containment Regulations.